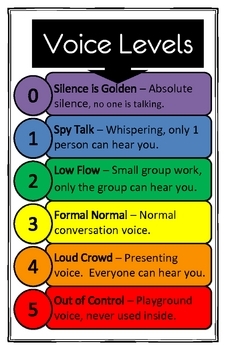 This is a colorful visual to manage voice levels. Each voice level is identified with a cute name, number, corresponding color, and description. In my classroom I post it on the board and put an arrow magnet so students know what's appropriate at that time. All I have to do is go up and point at which level is appropriate. It is on a 11X17 sized paper, so it can be sent in to a copy center to be printed in color. My students do very well with this!